Here’s some super exciting news, SUPERPLASTIC – the new designer toy company by Paul Budnitz and Huck Gee – have just added another fantastic figure to their JANKY Designer Art Toy Kickstarter Campaign!!! With the previously available BE-NI-TO Limited Eye-Strain Blue Edition SuperJanky 8” Vinyl Figure by El Grand Chamaco almost sold out, now fans can add to their pledges $70 to get this killer OH-NO! 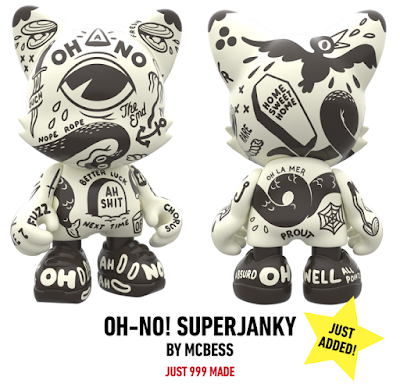 SuperJanky 8” figure by artist McBess. How rad is that!?!? 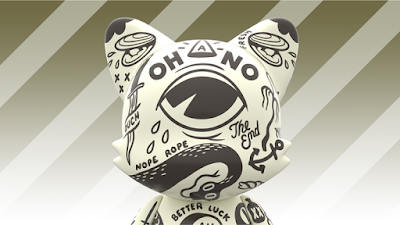 Eight giant inches of tattooed vinyl brilliance by everyone’s favorite genius French artist, MCBESS, the OH-NO! SuperJanky is limited to just 999 pieces. But as you know, the only way to get one is by pledging to back SUPERPLASTIC’s JANKY Kickstarter campaign! This is only the second SuperJanky released, so you definitely don’t want to miss out on this one. Collectors can purchase one by just adding $70 to any one of the really awesome JANKY pledge levels available now, or by pledging at a level that includes this supersized figure.